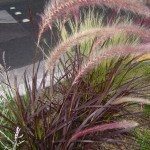 I have two pots of Purple Fountain grass. One has beautiful plumes but the other has NONE!! Why? Is one male and one female? Do I need to divide and mix the two, or is there another way to get blooms in the other pot? 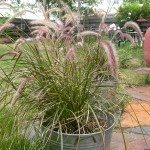 It is likely that the pot without plumes either has too little phosphorous or too much bone meal. Try giving it some bone meal. This will help increase phosphorous and should get it blooming.